The price of commodities, such as, crude oil and copper, are an integral aspect of the way electronic manufacturing suppliers conduct business daily. Since 2003, highly volatile commodity prices have dictated a steep change in prices issued to customers. With fluctuating prices, it has been difficult for both EMS and OEM companies to maintain price consistency. However, 2013 brought relief for many industries, and the 2014 forecast is promising. In America, domestic crude oil production surged, and copper supply hit a surplus resulting in steady prices. Crude oil plays an important role in many industries, especially when considering the cost of transportation. In America, crude oil prices are on a steady decrease. Currently, there is an ample supply for any rising demands in oil as energy production increases. It is forecasted that domestic oil will increase from 1 million barrels per day, to 8.5 million barrels per day, over the next year: more than any oil production in the past twenty years. Foreign oil is also projected to decrease in price. On January 12, 2014, an agreement was made between Iran and six world powers. This agreement was set to enable Iran's limited oil industry, which has been restricted due to sanctions over its nuclear program, to sell more crude when the deal goes into effect on January 20. There have also been an abundance of changes in Mexico in a similar regard. The Mexican government recently opened up the state owned oil company, Pemex, to foreign countries, after years of decreasing energy production. It was announced that foreign oil companies will now be permitted to partner with Pemex. For America, a country that is producing more oil than it consumes, this will allow for exports. With new partnerships forming, Mexican oil production is forecasted to double from 2.5 million barrels per day, to 5 million gallons per day, within a few years. This increase in production will allow for transportation costs to remain steady. Another import ant commodity for electromechanical cable assembly is Copper. 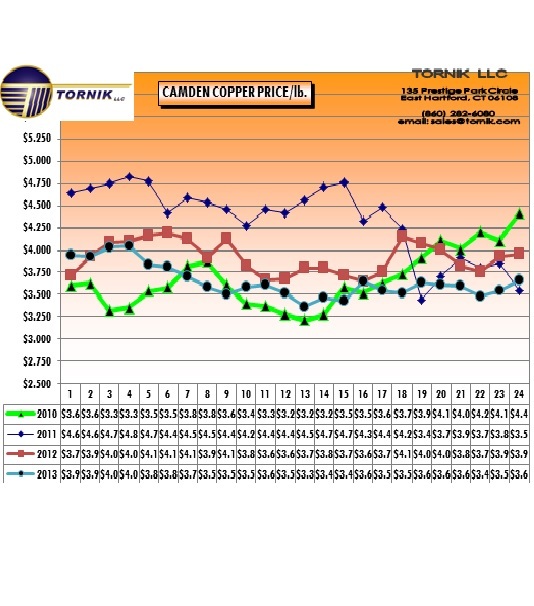 Starting in 2011, the price of copper has been volatile, making it difficult for manufacturers to dictate prices. However, a surplus in supply is predicted to steady the prices of Copper. According to Bank of America/Merrill Lynch the prices for copper will be neutral in 2014.
here is real demand growth in China. Since August, Copper prices have remained steady, averaging around $7,000 per tonne. There has been a surplus in supply in China, but many worry that the surplus is due to restocking, rather than, a true demand. What does the price of Copper mean for suppliers and customers? For suppliers, lower commodity costs will allow for lower costs to customers. As a cable and harness supplier, our prices have always been competitive given the strategic advantage of having a facility in low cost manufacturing country, Mexico. With the addition of commodity prices decreasing, Tornik is in the position to continue to provide competitive prices for your custom cable, harness, electromechanical and box build assemblies.